The ideal location for short (and long) getaways, Singapore must probably offer the widest choice of holiday destinations in the region. A visit to Kuala Lumpur should extend beyond urban, retail and downtown preoccupations; and according to the travel brochure, cool ‘Highland Resorts’, a few hours drive away from KL include Genting Highlands, Cameron Highlands, Fraser’s Hill, Bukit Larut, Penang Hill, Bukit Tinggi – variously described as exhilarating, charming, nostalgic, tranquil, enchanting, invigorating, scenic, 16˚C to 21˚C. All of which sound extremely alluring. 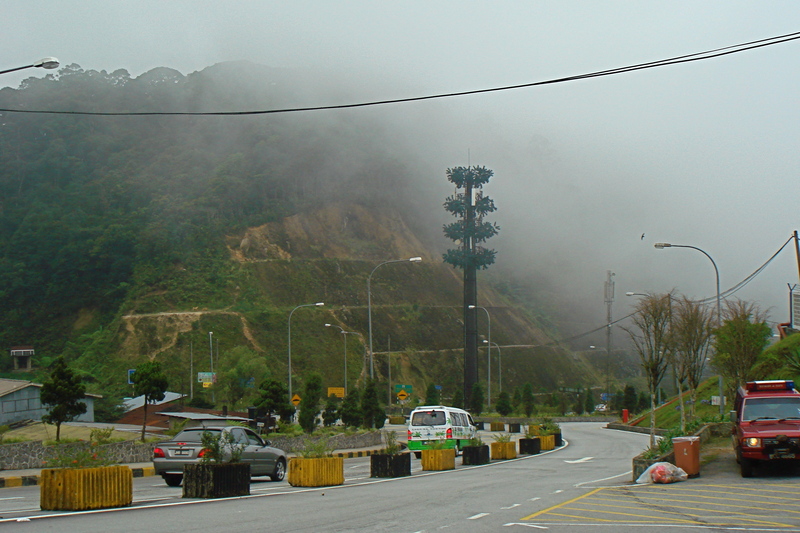 Genting Highlands, the shortest drive out of the capital (just under an hour), is an immediate choice. One has heard a lot about it from across the Johor Straits, especially the casino, the busloads of visitors, the weekend opportunities for striking it rich. Situated on a mountain peak, part of the Titiwangsa range dividing the states of Pahang and Selangor, Genting is 1,800m above sea level wrapped in mist. The roads are beautifully maintained and easy to drive, cutting through the hills and forests, leading upward into the clouds, past the town of Gohtong Jaya, the Awana resort (including a golf course and horse riding) and the Chin Swee Temple. Disney – Las Vegas in the clouds ? The shows are advertised on the way up, banners from lampposts, acts, artistes, attractions. The air is cool, the roads lined with hibiscus (red, white, pink, orange) and lilies; pines soar and ferns flourish and forests blanket the slopes with variegated green. Genting is mist and winding, climbing roads, theme parks (indoor, outdoor, water), rides, shopping, a Cineplex, fast food, fine food, hotels and gambling (the Casino de Genting with international shows and live entertainment for those above twenty one, and non Muslim). It is just about right for a half a day (or more) break – if you don’t include the casino – and the journey is perhaps more interesting than the destination, similar to the one through the hamlets and tea clad slopes to Puncak outside Jakarta, Indonesia. 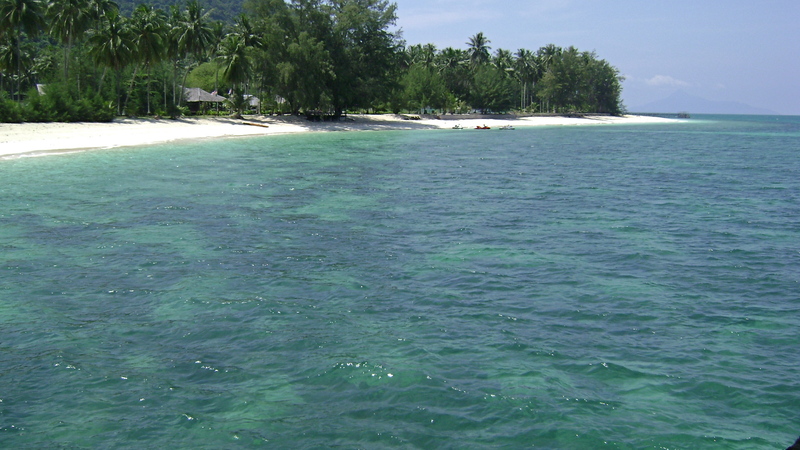 Short getaways across the border are the easiest thing to do and a few hours by road from Singapore lie the islands of the Johor Marine Park archipelago, Pulau Rawa, Pulau Aur, Pulau Dayang et al. 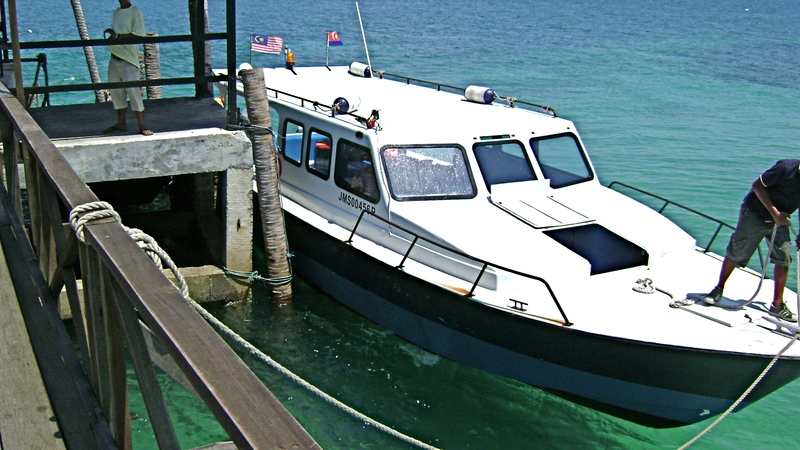 Our destination is Pulau Besar, the largest of a group of three islands, about two kilometers wide and five kilometers long, surrounded by the bluest of blue waters. Fifteen minutes to the Singapore border, across the bridge to Johor Baru. Immigration clearances on either side can be quick or lengthy, depending on the time of day and traffic between countries (take time to comprehend the warning signs posted by all the counters Beware of the swing flapper). Through the palm oil plantations stretching along Malaysia’s southeastern coastline, past Kota Tinggi to Mersing, to the jetty, onto a ferry and a half hour boat ride to Pulau Besar, flying fish occasionally keeping company alongside. 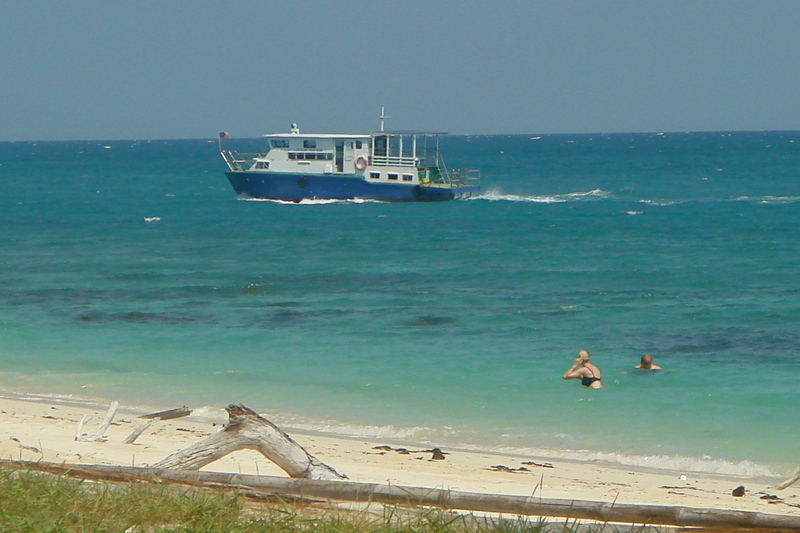 The few resorts are all on the more protected western side of the island but the sea can be rough; the weekend break is perfect for sunbathing, quietude, bobbing the waters on inflatables, a good book, sea-and-sand induced tranquility. A small pool sparkles by the dining area, a couple of jet skis churn the waters and snorkeling in the ocean can be organized. We are a group of twelve – six children between the ages of five and eighteen, six adults – which translates into permanent residence under the sea almond trees on the beach, sand castles and the examination of hermit crabs, long walks, water frolic and six bottles of wine and the pleasures of family and friendship. And a birthday is celebrated under the light of a waxing gibbous moon, the orb more than half, but less than fully illuminated. (Idle thought: is the night suspended between a full moon and a half moon, or a half moon and a full moon ? It could be either, scientifically speaking). Champagne is popped and a chocolate cake, which has been sat upon by the five year old, is cut sans candles (the breeze is too strong) and paper plates and presents handed out by torchlight and the bubbly is poured and the teenagers get to sip French fizz. 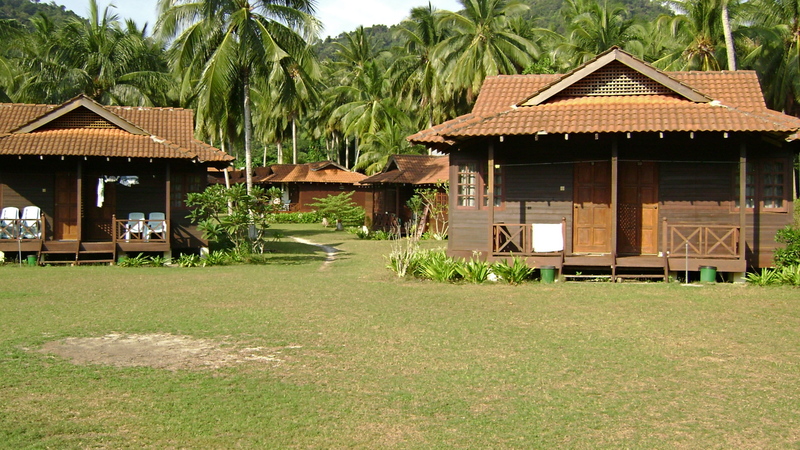 D’Coconut Island Resort is not swish or swank but it is serene, sandwiched between the aquamarine of the waters and the emerald of the mountains; and the staff are friendly and obliging. Local food is plentiful, inexpensive and fresh. MG Restaurant in Mersing is a must: it can accommodate hundreds (but not today) as the skies lower and darken and the rain beats against the windows and an expansive, delicious spread of Chinese food arrives platter by steaming platter. Fried rice, egg noodle soup, fried prawns, steamed fish, tahu (bean curd) with vegetables, fried chicken, chicken a la Hong Kong, pickled chilies, fresh chilies in soya sauce, Chinese tea, beer, soft drinks, ice lollies … and the bill for twelve is less than a hundred Singapore dollars.